TenStep specializes in preparation for the Project Management Professional Certification Exam. Our PMP® Exam Prep programs are the industries most effective and efficient study materials that are proven to work. We're so confident that you'll pass the PMP® Exam with our products and services that we offer a Risk Free - Money Back Guarantee! 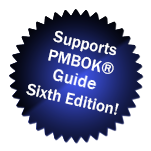 Compatability with the PMBOK® Guide Sixth Edition now available! PMBOK® Guide Sixth Edition content! Raise your score by practicing our practice PMP® Exam questions. Practice tests are one of the best ways to prepare for the actual exam. This product gives you an opportunity to better understand the exam and types of questions. This PMP® Exam Prep class is designed specifically to help you pass the PMP® certification exam. We offer classes in the USA and abroad. If you don't know the required formulas, you don't stand a chance to pass the exam. The PMP® Exam Formula Study Guide and Cheat Sheet is a complete approach that will teach you the PMP® formulas, values, and acronyms. You even get sample questions to test your knowledge. The PMP® PrepCast™ covers concepts, tools and techniques you need to be familiar with to take the PMP® Certification exam. You'll get 38 hours of video lessons and 9.5 hours of audio lessons. You can watch them as often as you like to enhance your understanding.